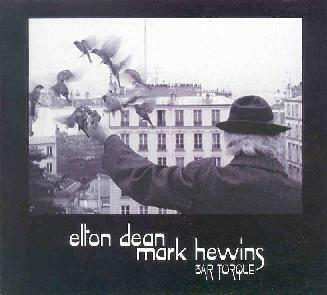 Elton Dean & Mark Hewins - "Bar Torque"
Now here's an interesting collaboration. Saxophonist Elton Dean (Soft Machine, Soft Heap) and guitarist Mark Hewins (Soft Heap, Gong) have put together a set of duo improvisations that straddle the line between jazz and ambience. Dean has a gorgeously melodic playing style that longtime fans will surely enjoy. But what gives the music it's special character is Hewins' harmonic guitar techniques which include rubbing, blowing, and tapping his guitar, as well as cautious use of Midi technology. When I reviewed his The Electric Guitar and Big Big Spaces albums (see AI #12) I was struck by the seemingly endless variety of sounds Hewins could coax from his instrument, some sounding like keyboards, though still recognizable as a guitar, and some that sound like pure ambient space. Bar Torque consists of three tracks. Clocking in at 25, 13, and 14 minutes, the duo have plenty of room to stretch out and develop their improvisations. The beauty of the music is that it journeys along, quite deliberately, but more as an occurrence in time rather than a concern for direction or goals. Throughout the album Hewins amazes with such sonic creations as rushing wind, chirping birds, various percussive sounds, and a string of bells that struck me in particular, each note including a distinct initial attack and a subsequent note. As he plays a melody on these "bells" Dean's saxophone sings in harmony, the combination creating an entrancing marriage of music, atmosphere, and sound. Hewins also creates dark background drones that rumbled to the point where the desk my speakers sit on vibrated audibly. The contrasts between what each musician produces is striking, yet not so much as how the cooperative result works so well. Another highlight is the ambient experimental sounds Hewins produces on "Sylvan", at one point sounding like an ambient sitar, and another being such a low drone that the depth and intensity of it sent caused a rumbling between my ears. Yet Dean is still playing his lyrical sax melody, not once being drowned out by the guitar despite the volume it's operating at. Overall, a beautiful set of music, and a case study for guitarists from which they'll spend many tranfixed hours gathering ideas (or just figuring out how he dunnit). Bar Torque is distributed by Moonjune Records. You can visit their web site at: http://www.moonjune.com/. Contact via snail mail c/o Moonjune Records; 32 Union Square East #200; New York, NY 10003. There's loads of information about the Canterbury scene at Mark Hewins' Musart web site: http://www.musart.co.uk.